Developed by Seaven Studio as part of the Ludum Dare gamejam festival, Inside My Radio is a rhythm platform starring anthropomorphic squares who must run, jump, dash and slam to the beat in order to complete a series of mostly linear levels. 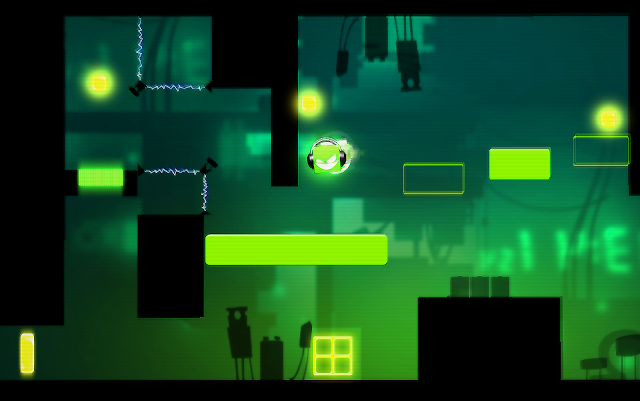 Its gameplay is reminiscent of other rhythm platformers such as Bit Trip Runner and Sound Shapes, but unfortunately doesn't feature the same level of depth and engagement. Related reading: Sound Shapes is a rhythm platformer that is absolutely essential. Matt's full review. Let's get this out there first off. I like rhythm games. I mean, I really like rhythm games. I like them so much that if I were performing a basic action like walking or eating while music were playing in the background, you can probably bet that I'm subconsciously synchronising my actions to the beat. And this is why I think I enjoy Inside My Radio a whole lot less than I probably should - it's a rhythm game for people who don't particularly like rhythm games. It plays just like any other platformer, with free movement and buttons for jumping, dashing and slamming, but the catch is that each button press needs to be synced with the basic rhythm of the background music for it to register. Much of its challenge lies on being on-beat which, if you've played any rhythm game which isn't Guitar Hero, you'd already be an expert at. Peel away the challenge of having to perform your actions on beat and you'll find that Inside My Radio is not much more than the most basic of platformers with a moderate sense of style and a decent soundtrack. The game is split across a series of levels each with a different theme of music, and you'll be playing as three different main characters who unfortunately are all some form of square with a face drawn on. They have about as much personality as one would come to expect from a beta release, and the same can be said for the story which relies too much on vague pronouns to suggest that the game's world is in danger from... something. 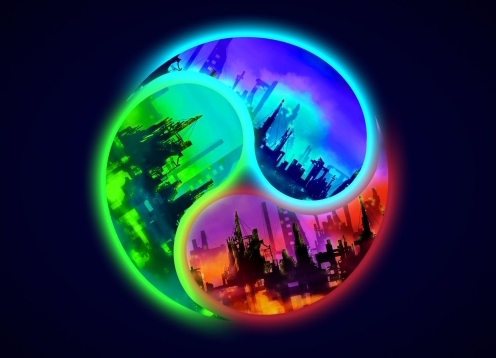 It's unfortunate that these two aspects feel incomplete, because otherwise the production values are quite high - the backgrounds and levels are designed with care to reflect the style of music, and there are some great ways that the developer integrates visualisations of the background music to help your timing. Judging by this and the brevity, it's evident that Inside My Radio is a gamejam entrant with many aspects which could have been expanded on. Don't get me wrong - I love gamejams and the creativity they encourage for gaming as a medium, but to me Inside My Radio feels like a fusion of the most basic parts of two genres - the platforming features some of the most basic patterns I've seen and the rhythm never deviates from crotchets on a 4/4 beat, and even though the music style changes your gameplay largely won't. Related reading: And of course we can't talk about rhythm games without mentioning Hatsune Miku: Project Diva. Matt's full review of the second game on the Vita. The main issue that players will have with Inside My Radio though is the difficulty. Not that it's overly easy or hard - I personally found it far too easy but other reviewers have found the game frustratingly difficult. To figure out the reason for this, you need to think a little bit about how the platform and rhythm genres work separately, and together. In platformers, most of the difficulty comes from precision: timing your jumps, avoiding enemies, pressing buttons at the right time and prioritising the path you want to take. In Inside My Radio however, many obstacles are synced to the beat but so is your ability to move and jump altogether - this means that if you can follow the beat, you'll just naturally avoid most of the obstacles. If you watch gameplay footage of people who claim the game is difficult, you'll find that many of the players stubbornly refuse to acknowledge that this is a rhythm game and keep attempting to jump off beat. As a rhythm game fan, I have to say that Inside My Radio left me disappointed. It might have been an amazing experience had I been unable to follow a simple beat upon starting up the game, but years of experience in the genre made the experience entirely trivial. I do think there is a great game here, but it would need a lot more expanding in order to contend with the greats of the genre.